TYRONE defender Cathal McCarron is on the verge of a club switch to Kildare outfit Athy. The Dromore man tweeted following the Tyrone SFC defeat to Clonoe last weekend that he was saying ‘goodbye’ to his home club. 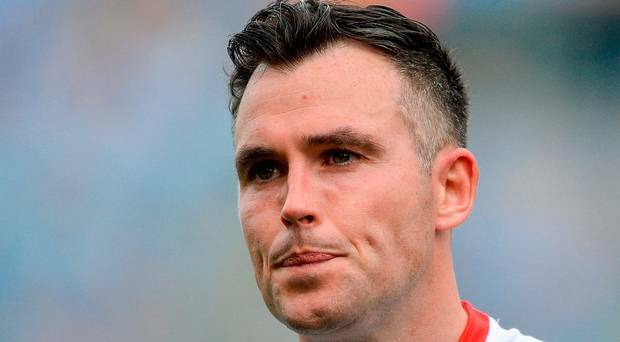 It is understood that McCarron is moving to Athy, where his partner hails from, and the local club chairman there, Marty McEvoy, has indicated that a transfer is on the cards. McCarron, a 2016 All-Star nominee, also has previous links with Athy, where he attended the Cuan Mhuire rehabilitation centre for gambling addiction. “Emotional evening having to say goodbye to my club @dromoregaa,” McCarron tweeted on Sunday. And McEvoy said last night: “The club would be aware that he (McCarron) would hope to move to Athy. McCarron also trained with Athy during his time as a patient at Cuan Mhuire. The experienced defender (29), was also an All-Star nominee in 2013 and 2015. It remains to be seen how McCarron’s proposed club switch would impact on his Tyrone career, considering that the player would be looking at a six-hour round trip to inter-county training sessions with Mickey Harte’s Red Hands.